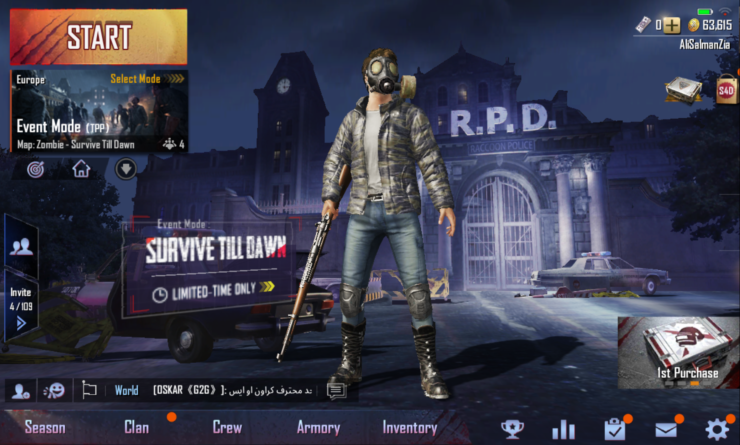 PUBG Mobile and Resident Evil 2 just launched a crossover event which brings the mighty anticipated Zombie Mode to the table. The new Zombie Mode was resting in the beta phase for quite a long time and now, it is available for iOS and Android users. If you still haven’t updated the game, we would totally recommend you to do so. For now, let’s all dive in to see what the latest update brings and what we should know. PUBG Mobile “Survive Till Dawn” Is Now Available On iOS And Android – Beware Of The Zombies! It’s a very unique crossover that brings us the “Survive Till Dawn” special mode. The mode features 30-minute rounds which span over three days and two nights. To be more precise, the last person standing at the end of the cycle wins. The cycle works as (day / night / day / night / day). In addition to this, 60 players will face each other and the zombies as well. In the day time, the zombies are pretty docile but at dusk, the creatures become quite fearsome and dangerous. There will be zombie characters such as Police, Lickers, and others created by the PUBG Corporation team. Special characters from the popular Resident Evil includes a Tyrant which will spawn randomly. It’s good to see that PUBG is staying relevant in the mobile gaming industry by introducing new modes and features. I’ve played both, Fortnite and PUBG on mobile and the latter is just more optimized. This stretches out to areas like how you pick up guns and ammo as well as the inclusion of bots. However, both titles share their own set of uniqueness. The “Survive Till Dawn” crossover is now live on iOS and Android, so if the update is not installed automatically, be sure to do it manually. There will be more to the story, so be sure to stay tuned in for more details on the matter. This is all for now, folks. What are your thoughts on the new PUBG “Survive Till Dawn” update? Have you given it a swing? Let us know in the comments how you like it. Tim Cook Is Now Formally Tim Apple On Twitter! SAMSUNG GALAXY FOLD – Its Finally Here!